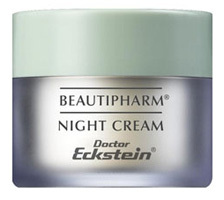 Rich, essential night cream for every skin type, especially sensitive and delicate skin conditions. Provides plenty of moisture to keep the skin smooth and supple while offering antioxidant benefits to protect from environmental causes of premature skin aging. Contains cocoa butter, allantoin, bisabolol, natural moisturizing factors & vitamins A+E. Only vegan ingredients are used. Product contains NO mineral oil, silicon oil, artificial colors or perfume oils. After cleansing and toning, apply a thin layer to face and neck area. Let the cream absorb completely or massage in gently.